I love being part of a blog hop!!! Yes, it is another thing I have to do…but when you see the finished quilts made from these events it makes it all worth while, I just helped someone (Kathy) with their setting for the Patriotic blog hop we did last year…her quilt is going to be amazing!! Click here to order GROW KIT Kits are $12. THANK YOU for Blog Hopping with us ALL…We sure APPRECIATE you as our customers!!! Without you events like this would not be happening!!! 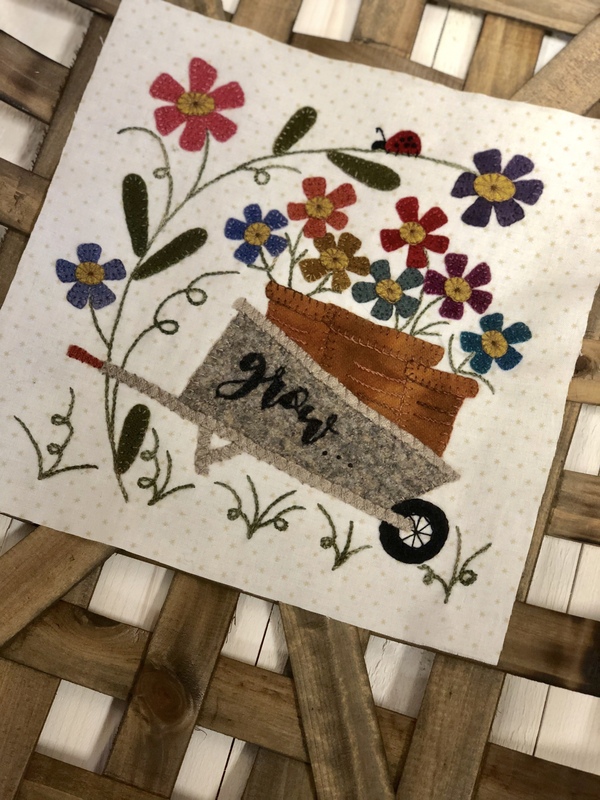 Previous Post Moon Garden Mystery Stitch-A- Long!!! I knew that yours would be gorgeous!! Thank you, I do try and talk about the designers I follow when doing this type of project ! Usually thank them on their blog too. Love reading your posts and you talk about your life as well as your job, you are inspiring to many of us !!! I love this block! Trying to order kit and it states in stock but there is no button to add to cart. I just love these blocks so far. It should make a really neat wall hanging once all the blocks are done. THANK YOU ALL!!! I am interested in the Moon Garden BOM with background fabric. I clicked on the “green with fabric” but did not let me register. Is this option still available? Should I call the shop directly with my details? What a nice block to get us thinking about Spring. Today I awoke to snow covering my crocus & daffodil shoots. Fickled weather. This is such a cute block! It really does compliment Rhonda’s block! My ‘to do’ list is growing, too! Also, any progress on the triangle gatherings setting? Those blocks are done and eagerly awaiting a home. I seem to be having trouble collecting some of the blocks that have already been posted in February. I have received yours Lisa but can only access one of the other ones. When I go to the other websites for February I don’t see their free pattern access only the ability to buy the kit. Any help you can give would be appreciated! Thank you! Question on block size and finished size. Is finish size for this block correct at 9 1/2″? Wondering the same thing. I was just going to cut out the background, but the size is conflicting. Can we get a confirmation on which is correct? You never cease to amaze me with your beautiful designs. Thanks for the great block. I was unable to download and print the block from last week. I tried 3 times. What did I do wrong? I love all the blocks so far. Thanks for keeping us inspired! I’ve followed prior instructions to look at the blocks specifically for the March 9th the rusty Crow strawberry trellis in a pot block of the week download, but it is nowhere to be found. The blog has not been updated since 2017 and that week’s download is nowhere to be found. Is there anyone out there the who can help me please? A million thank yous!